"Le Page du Pratz's Fabulous Journey of Discovery: Learning about Nature Writing from a Colonial Promotional Narrative" is included in a collection of essays edited by Steven Rosendale and entitled The Greening of Literary Scholarship: Literature, Theory, and the Environment (University of Iowa Press, 2002). It focuses on the first and fourth of the translated excerpts found on this site. "Plotting the Natchez Massacre: Le Page du Pratz, Dumont de Montigny, Chateaubriand" Early American Literature 37:3 (2002) 381-412, discusses the Natchez uprising recounted in the fifth excerpt below. If you would like copies of either of these articles send me an email. Chapter 5, "The Natchez" in my book The Indian Chief as Tragic Hero: Native Resistance and the Literatures of America, from Moctezuma to Tecumseh (Chapel Hill, 2005) is about the Natchez rebellion, and expands upon the article in EAL. "Natchez Ethnohistory Revisited: New Manuscript Sources by Le Page du Pratz and Dumont de Montigny" Louisiana History 50:4 (Fall 2009), 407-436. “A Newly-Discovered Manuscript Map by Antoine-Simon Le Page du Pratz” French Colonial History 11:1 (2010), 23-45. “How to Succeed in Exploration without really Discovering Anything: Four case studies from Colonial Louisiana, 1714-1763” Atlantic Studies 10:1 (2013). A note on the name Le Page du Pratz: Most scholars who have written about him abbreviate his name as "du Pratz." However, his manuscript signature, such as above, was "Le Page," and so I refer to him that way. However, if you are looking for him in an index or a library or archive catalog, you may need to search under "L" and "P" or even "D"! The French colony of Louisiana was established under Pierre Le Moyne d'Iberville, who led three expeditions, beginning in 1699, that built small forts near modern Mobile, Alabama, and Biloxi, Mississippi. In 1718 the colonial capital was moved to a new site at New Orleans. [Click here for a map of the lower Mississippi area published in Le Page du Pratz's book, and here for the fold-out map of the entire Mississippi Valley.] The French recognized that the Mississippi River would become the corridor for trade and colonization in the center of North America, and by securing the mouth of this great river, they hoped to connect their settlments in Québec and Illinois with those on the Gulf of Mexico, and thus to outflank British settlements on the continent's east coast. History foiled this geopolitical scheme, however. The French surrendered their claim to Louisiana to Spain in 1763, at the same time that France's loss to England in the Seven Years War resulted in the surrender of Québec to the British. French "creole" colonists remained the dominant population around New Orleans, however, and in 1801 Spain returned Louisiana to French control, just before Thomas Jefferson negotiated the Louisiana Purchase. Antoine-Simon Le Page du Pratz was probably born around 1695. He came to Louisiana in 1718, and remained until 1734. He had some training in engineering, architecture, and astronomy, and enough wealth to obtain a concession near Natchez, in today's state of Mississippi, under the entrepreneurial colonization scheme organized by John Law and the Company of the West. He lived at Natchez from 1720 to 1728, along with a native woman of the Chetimacha tribe (with whom he seems to have fathered children), and a few African slaves. His familiarity with the local Natchez, and knowledge of their language and customs, is the basis for some of the most unique and fascinating parts of his writings. He returned to New Orleans to take an appointment as manager of the Company's plantation, and thereby avoided being killed in the so-called Natchez Massacre of 1729. This uprising, which he described in detail, destroyed the French Fort Rosalie and killed nearly all of the male colonists there, and led to the King ending the concession of the Company of the West, and seizing control of the plantation that Le Page du Pratz was managing. For unknown reasons, Le Page du Pratz waited more than fifteen years after his return to France before he published anything about his experience in Louisiana. Then the Journal Oeconomique, a Paris periodical devoted to scientific and commercial topics, published in twelve installments between September 1751 and February 1753 a "Memoire sur la Louisiane" by Monsieur Le Page du Pratz. This contained in abbreviated form the material for his subsequent book. In the November 1751 issue Le Page also published a separate article "Concerning the draining of marshlands, & the means of building solid levees" including drawings of a simple movable crane. His expertise must have been acquired in Louisiana, but he also mentions having learned from "the time that I spent in Fontenay-le-Comte in bas-Poitou" and that "the success of a capstan that I invented, in service to the King at Rochefort" had been sent to the Academy of Sciences and earned him a commendation from His Majesty. If this leads another researcher to find more clues about Le Page's life in Fontenay-le-Comte (a town in the Vendee marshes, just north of La Rochelle and Rochefort), please let me know. In 1758 appeared the three octavo volumes of the Histoire de la Louisiane. Part of the book is devoted to ethnographic description of the native peoples of Louisiana, particularly the Natchez whom he knew so well. Other sections, reflecting its title, describe the history of the colony, from the Spanish and French explorers of the sixteenth and seventeenth centuries through establishment of the French settlements along the Mississippi. The book was also intended to have a practical value for French colonizers; it offered advice about agriculture, climate, trade with the natives, and the management of slaves. Those who are interested in reading it in the original French, it is available on-line through the Louisiana Digital Library. In 1763, just after the British victory in the Seven Years War, a partial translation of Le Page du Pratz's work was published in London. The title, The History of Louisiana, or of the Western Parts of Virginia and Carolina, subordinated the former French colony to its English neighbors to the east, and its preface asserted that English "nation may now reap some advantages from those countries...by learning from the experience of others, what they do or are likely to produce, that may turn to account." The translation severely abridged and rearranged the text, and although anglophone scholars have long used the English edition and quoted from it, it should not be regarded as authoritative. It is for this reason that I began developing this site and my translations you'll find below. In addition, in the summer of 2003 I taught at the Newberry Library in Chicago part of a National Endowment for the Humanities Summer Institute on "French Travel Writing from the Americas, 1500-1800." Participants in the institute read most of these translations and studied the Louisiana colony alongside those of New France, Brazil and Haiti. Le Page's Manuscripts in Archives. In June 2005 I visited the Chicago Historical Society to follow up a hint from a colleague that a few manuscript letters from Le Page du Pratz are held there. I found, in the Otto Schmidt collection of French colonial documents, two manuscripts. One is a letter to his mother, dated 1 February 1724, and the other an 18-page ”Relation of the Voyage that Mr. Le Page du Pratz made from New Orleans to Natchez on the Mississippi River in 1720 and 1721.” This is not so much a travel narrative of this trip as an early outline of the kind of publications he finally released 30 years later. He lists in the margin the major French forts in Louisiana, and some of the rivers and islands, plants and animals, and Native nations found there, and briefly describes each in the text. In the middle of this sewn booklet is another one consisting of notes from the 1720 book, Relations de la Louisiane et du fleuve Mississippi, published in Amsterdam by Jean Frederic Bernard. Bernard had compiled excerpts from Louis Hennepin's 1697 book, and from the spurious book attributed to Henri Tonty from 1698. My article in Louisiana History describes these manuscripts further. In May 2007 I learned that map dealer Martayan-Lan in New York City had acquired a manuscript map by Le Page du Pratz. It shows the entire Mississippi Valley, as well as part of the Gulf Coast and, in an inset, a plat of New Orleans. 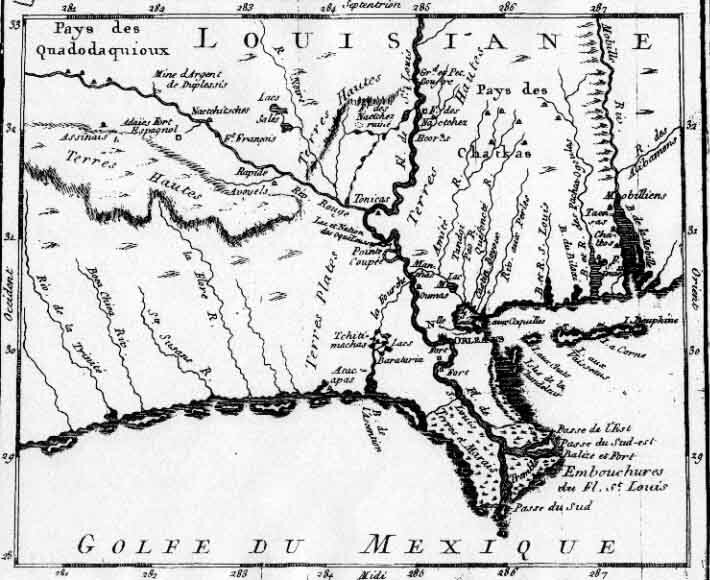 It differs significantly from the map published in the Histoire de la Louisiane. I believe that Le Page drew this map shortly after he returned to France in 1734, and I am preparing a publication about it for the July 2009 issue of Common-place. We are very fortunate that the map was purchased by the Library of Congress, and it should be available digitally soon. My article in French Colonial History describes this map. In July 2010 I finally was able to read the microfilms of the C13a series of "correspondance générale" between the Louisiana colony and Paris officials, which contains one additional clue to Le Page's career. In 1750 he made a prospectus for a return trip to the Mississippi Valley, to exploit the mines of "cristal de roche" or rock crystal. The two-page document is C13a vol. 24 folio 386. Le Page sought financing and assistance for this expedition, and the way he advertised the potential rewards sounds very much like fabulous voyage which is the first of the five excerpts translated below. So far, I have prepared translations of five sections of Histoire de la Louisiane. The first, chapters 16-19 from Volume 1, tells of a fabulous voyage of exploration that Le Page du Pratz claims to have made on the Great Plains. Along with ten Native Americans he calls "naturals" he finds evidence of lead and diamond mines, as well as observing the dam building skills of a subspecies of beaver. The second section consists of chapters 21-26 from volume 2. Chapter 21 includes the amusing story of how Claude-Charles du Tisné, an explorer of the Missouri River country whose name Le Page rendered as "du Tissenet," avoided being scalped by the Indians. Chapter 22 begins the first part of Le Page du Pratz's ethnography of the Natchez, describing the tribe's language and kinship structures, and continuing with their cosmogony, religious practices, calendar, and major feasts. Finally, he writes of how he was asked to marry a Natchez woman, and why he declined. For this section, I have worked in part from the translations published by John R. Swanton in Indian Tribes of the Lower Mississippi Valley (Smithsonian 1911). Swanton put together a lengthy ethnohistory of the Natchez, relying on translated excerpts from Le Page du Pratz and other French colonial writers, arranged in an ethnographic catalog. Swanton thus printed a little more than half of the complete text of these chapters, but I have edited his translation where I find it too literal, and have tightened up the punctuation of Le Page du Pratz's long, paratactic style. Most of the remainder was translated by undergraduate research assistant Nicole Degli Esposti during the Winter and Spring of 2002. Her work was invaluable to the project. The third section comprises chapters 2-5 from Volume 3, and is also in html format. It continues Le Page du Pratz's ethnography of the Natchez nation, beginning with an account of the burial ceremonies and sacrifices that he witnessed in 1725 after the death of Serpent Piqué, or Tattooed Serpent, one of his closest friends in the tribe and an ally of the French. [The location of the Natchez version is now preserved as the Grand Village of the Natchez Indians historical site in Natchez.] Then it turns to the mythic history of the Natchez, their migration north from Mexico, and originally, Le Page du Pratz believes, from the Mediterranean. The translation of this section is also taken in part from Swanton's book. The fourth section continues with chapters 6-8 of volume III. Here Le Page du Pratz recounts the journeys of a Yazoo Indian named Monchacht-apé, who tells of his travels to the Atlantic coast and Niagara Falls, and then up the Missouri River and westward to the Pacific coast, in the region of Oregon or Washington. If authentic, his journey anticipated by more than 75 years the famous trans-continental trip of Lewis and Clark. I published an article about this episode in the on-line journal of early American history, Common-place.org, in the summer 2005 issue. Moncacht-apé's motive was not to find the long-sought Northwest Passage, however, but only to trace the origins of his peoples, who according to their own legends had migrated from a land far to the northwest of Louisiana. The eighth chapter concludes with a discussion of geography of the Northwest coast of North America, Alaska, and what are now called the Bering Straits, a region still little-known in the 1750s. Most of this translation is a revised version of that published by the nineteenth-century historian Andrew McFarland Davis. The fifth section consists of the narrative of the convulsive uprising of the Natchez people against the French, which began on 29 November, 1729. About 250 Frenchmen and African slaves were killed, and the colony at Natchez, which had been established by the Company of the Indies some twelve years earlier, was destroyed. Although Le Page du Pratz was in New Orleans at the time, he had contacts among the Natchez and among the French soldiers who could have informed him of how the revolt was planned. In particular, he writes of interviewing Bras Pique, the Female Sun or chief of the nation, who was imprisoned by the French after they mounted the first of many counterstrikes against the Indians. Other sources, notably the Memoires Historiques de la Louisiane by Dumont de Montigny, tell a similar narrative of the uprising, but none offers the details of the Natchez deliberations that Le Page du Pratz does here. The translation of this section is entirely the work of Nicole Degli-Esposti and myself. We will be working on chapters twelve to sixteen during the winter and spring of 2003.